Enter "elevate" to watch this amazing webinar! Elevate Your Social Network from Jake Kelfer on Vimeo. The Elevation Station is back! Elevate Your Social Network is all about how to effectively use social media to build authentic relationships and create opportunities. In the webinar, Jake discusses the do's and don'ts of social, how to use each platform for networking, and how to leverage social media for one's career journey. In a world predicated on relationships, this workbook will help you connect with people that can change your life. 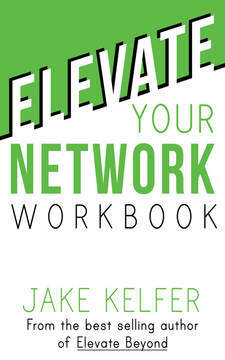 Whether it’s CEOs, athletes, decision makers, managers, etc., you will find the keys to unlock the secrets of networking in Elevate Your Network Workbook.